First of all, news about the prizes from the Grand Draw. I posted all the UK ones on Thursday, standard postage. Some even arrived at their destinations the following day which was a pleasant surprise. All the remaining prizes, which are non-UK of course, are packaged ready for me to take to the Post Office this coming week. I wanted to do that yesterday but for various reasons I didn't manage to get out - I'll put something on the blog once the posting is done. It would be really good if you could let me know that your prizes have arrived OK. Even leaving it within a comment on here when you add your entry will be picked up by me. - then glued the sentiment, narwhal and sets of hearts and bubbles in place - finito! I dithered a bit about using the little row of bubbles and hearts (bottom left of the card) but it shows everything that comes with the set of stamps and dies, plus it somehow pulls everything together (IMHO). Len hasn't seen this card so just might keep it for his Valentine's Day card. 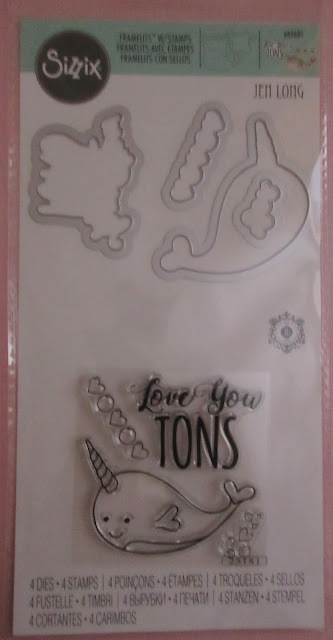 It's the Sizzix 'Love You Tons' set of stamps and matching dies of course. I fell in love with it and after some hunting on the internet I managed to order one for myself as well! I'm offering it now as it might come in handy for your own Valentine's Day cards. When there are weeks that I fancy making a card which perhaps is inspired by one of your wonderful ideas (such as stripes or inchies) then the other items will pop up as one or two bundles as I can't find any of them available in on line shops. HUGE thank you again to Lynn - and I still have a couple of items left that Viv sent as well. The Toy Box is depleted of Christmas items (although one of the stamp sets Lynn sent has a Christmas/New Year theme). But, it's looking pretty healthy until well into Autumn 2019 and there are lots of fun prizes in the offing. 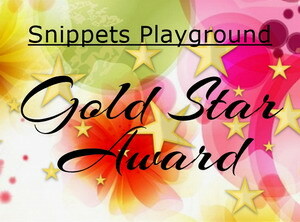 As always, the Snippets Challenge will run for two weeks and the Playground gates will close at 11am UK time on Saturday 2nd February. The gates will open again at midnight UK time on the same day. Remember, if you link into the Playground and don't say clearly that you're wanting to be in the draw in a comment on here, then you will be bypassed if your name comes out of Mr Linky. I'm sure you all know I ask for a positive 'yes' on the blog post itself - just in case you're only playing for fun. An update on Dudley now! We're getting precious little sleep here as his adult teeth are now coming through along each side, upper and lower and to be honest there are times when he really 'doesn't know where to put himself' as my Granny would have said. He woke up all confused yesterday evening and promptly piddled without warning us - serves me right as I was talking to a special friend just a matter of hours earlier saying proudly that it had been weeks since he had an accident! We're still letting his fringe grow for now as before too long it should begin to fall into a parting to frame his sweet little face - but, a lot of the time he looks a real little mop head! More so as the girls blow dried his fringe forward whereas I keep brushing it back. He's starting to get a cute little crooked smile - a typical trait of many Havanese, and very occasionally tilts his head to one side quizzically if he's listening to what you're saying. He's growing up in so many ways! Have a lovely fortnight and I do hope the cold snap we're due isn't too unkind. Oh my goodness--the update on Dudley with the adorable picture just made my day! Difficult start to the year, but you've made me forget right now! Cute & clever card, Di! I'll play just for fun. What an utter cutie, of course he has everyone eating out of his fluffy paws. Cuteness personified! Love the narwhale card Di, I agree with your IMHO statement and remember seeing a real narwhale horn at a display in ... mm castle home owned by Taussaud family..
...ah Google thank you, Warwick castle. It was one place worth visiting, truly amazing, they had a working catapult an we had to sit and watch it work, cos nephew wanted to, so did I actually. Fascinating waxworks throughout too. I do have cards just posted must go back and link up. Had snippets and recipe of course. Lost track of fortnight’s. Oh my goodness, that photo of Dudley after his grooming had me squealing with delight. 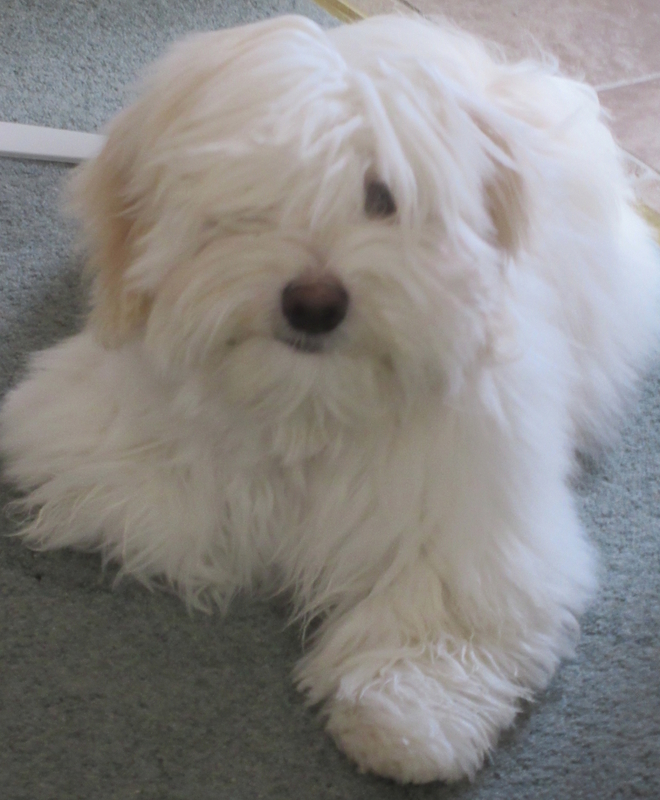 I love his little crooked smile and mop head!He's so lucky to have owners who are very knowledgeable about all the puppy stages and are so patient with him. Your card is delightful and that narwhal couldn't be cuter. I got this set for Christmas so will be playing just for fun this time! Oh my goodness what a spooky coincidence - I just woke up from a complicated dream that involved buying a narwhal stamp when I'd gone out for a unicorn one. 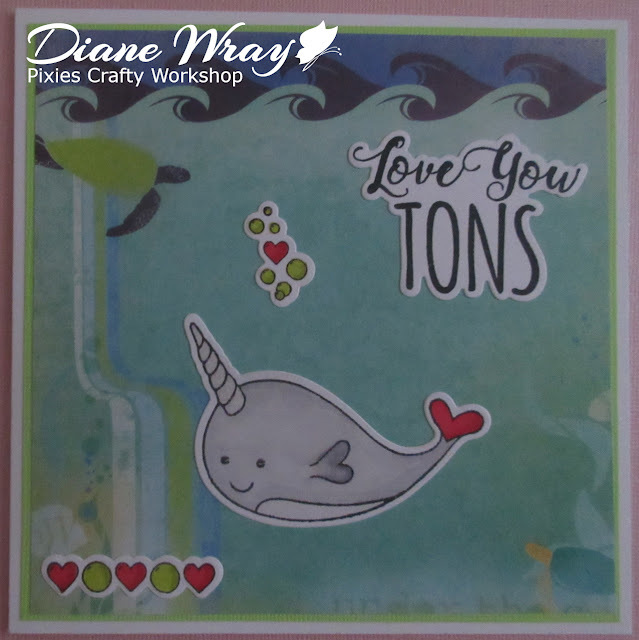 I woke up, thought "What nonsense, I've never even seen a narwhal stamp", switched on the PC and here you are making a gorgeous card with the cutest narwhal ever! So as soon as I've made my card I will HAVE to play along, won't I? And no wonder you've made such a cute card, you have a permanent cuteness inspiration right by your side (and probably chewing your shoes). He is gorgeous! This dog is just precious. He makes me want to cuddle up on the couch with him. Cute Narwhal card and even cuter pup. I ADORE him from afar. With a crooked smile & an eye peeping out of his fringe I'm certain he got away with his little accident immediately! You just can't be cross with that bundle of joy for long!!! I like your card so much! That whale is just adorable, and so is Dudley. Seems he already needs a haircut (LOL!!). He is such a cuty!! That is such a cute stamp/die set so it is a 'yes please' from me. Your choice of background is brilliant and just sets the whole card off - gorgeous result. Speaking of gorgeous the 'pupdate' photo is another example - he is adorable. Yes Please to the prize draw - the whale is just adorable! A lovely card and such a cute stamp and die set - I would love a chance to win please. Dudley is so cute and I bet he's keeping you both on your toes! Oh wow...look at how grown up Dudley is looking...super cute too! As is your card Di - I didn't know that I *needed* a narwhal stamp...but am now thinking 'why don't I already have one'! Ha ha! Awww... Pure cuteness!! This narwhal is just delicious!! I made a massive use of Sizzix dies, but I didn't know this one!! LOVE the dp you used, it's just perfect for the scene!! Now you have some snippets to play the next time :D LOL. The row of tiny hearts and bubbles compliments so well the card! He looks awesome after the grooming session, such fabulous ball of white fur!! Oh Di, this is such a fun card. I don't think I've ever seen a narwhal stamp before and this is adorable. His tail is the cutest along with that row of tiny hearts. You made a great Valentine card with it. I don't know how you stand all that cuteness with Dudley. I would want to snuggle him all day long. He is just the sweetest "furball". OMGoodness, Dudley is simply adorable! I see his crooked smile! What joy he must bring to you! No wonder the groomers love him! I love him too! Hope he gets through this stage soon so you can get some sleep! I love your cute card! The little narwhal is adorable - just look at the little heart on his tail fin! Cuuuuuute! I'm definitely a Yes for the prize! Thank you and thank you to Lynn! For once I entered early! Woohoo! Have a wonderful day! Love that little dog! What a cutie! He makes me smile. I love your wavy card Di and the little narwhal is so cute!! Even cuter though is the adorable Mr Dudley and I can see why you adore him in spite of the disturbed sleep!!! Your dog is such a sweetie. Love your card too. Yes for the great prize please. Great card, Di. The backing paper makes a perfect background for your little scene. I'll be back later to link up a card, but I'm just playing for fun this fortnight. Dudley is too cute! Looks like my little MADDIE! You will see her on some of the pics on my blog! I would love to play for the prize ;) So much fun! Two very cute photos Di! Love your card and the photo (and story) of Dudley just makes me smile! Playing for fun this time. Di, your narwhal card is adorable. I like the background and little hearts. And Dudley is such a cutie. Would love to play for the prize. Super cute!! That narwhal is adorable and so is your sweet, little Dudley! I think I will play just for fun this week, thanks! Your card is adorable. And a bit "Yes please" to the chance to win the prize. Not only do I visit your blog for your lovely cards, I get a puppy story too! Eeeeeee.....ADORABLE Dudley and ADORABLE Narwhal!!!! Cuteness all over the place!!! Love your fun card, Di. And, of course, you had to use that fresh sheet of patterned paper because it was so completely perfect for your card....and now you have a few scraps to use! Yes, please, to the fun Narwhal set. Although I do not think I could handle a real narwhal in my household (small bathtub and all....), I would love to add this delightful one to my stamp menagerie! Yes please to the prize draw, ages since I played along, Dudley is sooo cute!! Oh how adorable! Dudley looks so cute and I can just imagine what a darling he must be. Totally adorable little Valentine's card. And Dudley is turning into a very handsome dog! Just playing for fun. Thanks. Hi Di, I know it is a long time since I have been around but I was sick all last year but now I am fine so 2019 is going to be my year. do hope all has been well with you and Parsnip. Just playing for fun. What a darling Narwal with his heart fin and heart tail. So cute!! And your card is fabulous. That paper IS perfection with this set. Yes, please, for this sweet prize, and many thanks! Just uploaded my entry, a little late but you'll see why if you visit my blog. I WOULD say yes please to and entry in the draw but since I was lucky enough to win for challenge No. 343 I think it might be pushing my luck!!! Couldn't post last week as we were at a wedding fayre .. .. but have made it this week! Yay!!! Thank you for making the playground such a success .. .. you have done a fabby job. Just playing for fun as always! Love your card. What a cute narwhale image. Your little Dudly is simply adorable. I found your challenge through Darnell's blog. Yes, playing for prize. Love this card. And yes for the prize. Here's my latest snippet card, Di. I am just playing for fun this time. What an adorable Valentine, Di! Dudley does look like he's listening to you. He is adorable! So cute! Yes please to the prize. OK . . . now that you've found out about the wonderful Darnell's surprise party for you, it's safe to link my snippets card here (first time in, like, FOREVER!). Well, I couldn't miss out on your special party now could I? You're such a special person, and even though the night is young at the linky party (so to speak) it is already plain to see how much you are loved and appreciated for who you are and what you do. A much deserved party in your honour. CONGRATS mate. PS: There is NOTHING to see behind the bike sheds. Honest! But I've trained Dudley to give an early warning bark just in case you should wander nearby! LOL! Congrats on being the subject of Darnell's richly deserved tribute Di...and Dudley gets cuter by the second! Loving the pictures of Dudley, he is adorable. Yes please for the prize Di, what a fab set. Saying yes to the prize. Your furbaby is so adorable! How do you get anything done?? Thank you also for the sympathies for Bella. Just wanted to say Hi Di, i've been directed over by the lovely Darnell. Big congrats on your blog achievement. A wonderful way to bring creatives together. Such a sweet photograph with one eye peeping out... I feel my fringe is in need of a trim too. Wishing you a super day and hope to join in with a snippet challenge or too in the near future. Hi Miss Di,Parsnip and Dudley. Congrats on your 7 years running this excellent challenge. I love your wonderful card, and the design looks very stunning and super. Wonderful colours used and such very super stamped sentiment too. Managed to find a small box of snippets I hadn't thrown out for my card. Congrats to you for running the challenge for 7 years...WOW...!! I know what a challenge it is to run a challenge...lots of hard work but so worth it and I haven't been here lately, we just had a rough last year of 2018...but getting back into the challenge mode now..yay!! Anyhow thank YOU for all you do...and LOVE seeing little Dudley..he is adorable...my Mack weighs in at 52#'s and he is BIG I thought he would weigh lots more. 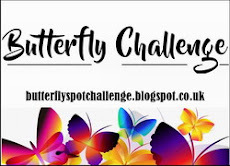 And Yes please to be entered into the drawing...if you want to come by my blog on the 1st, we are having a blog hop and lots of prizes to be given...have a wonderful day Di and once again thanks for having such a FUN place to use our 'snippets'!! Well Miss Di... the secret's out, Congrats on the well-deserved Celebration of lovely YOU! 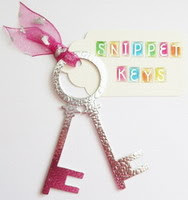 Just popping back in to say I linked up my snippets card! 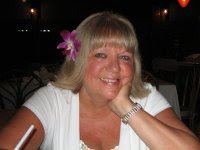 Thank you for all you do, Di! The Playground is a fun place to play! Have a wonderful day! Thank you so much for being such amazing person, this card is for you. And your card is super sweet, I love this cute design from Sizzix. Sorry i'm late getting back to you Di, no need to put me in the prize draw but *thank YOU* for popping on over to ask. I was very late to the party but so glad I made it before closing time. Thank you again for the challenge Di & best wishes to you all.